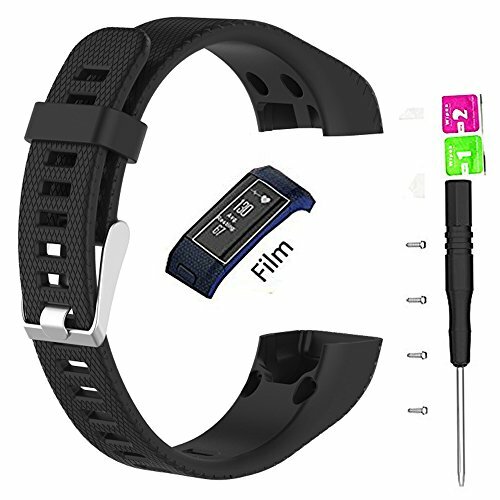 Please NOTE:The bands ONLY fit for Garmin vivosmart HR+ tracker,indeed DO NOT fit for Garmin vivosmart HR+ and other other devices!!! My dear friends,pls make clear your wearing tracker model and make orders.Thanks a lot!!! Material: Made of high quality TPE + TPU Rubber. Silicone material with Metal Clasps. Q：The band side that has the hole in it for the button does not even come close to fitting correctly. A:You might install oppositely the band sides.You can try to change the band side over then install again. ✔ Very Note: Only fits for Garmin vivosmart HR+,NOT for vivosmart HR. Please confirm your tracker model before making orders. ✔ Wrist Size：There are 18 holes for the striped band. Fit 5.70"-8.26" (145mm-210mm) wrist. The vivosmart HR+ bands can be adjusted according to your wrist circumstance; fits for Men, Women, Boys, Girls, and almost everyone. ✔ Easy to install：1 Screwdriver and 4 Screw nuts will be included.Easy to assemble and remove through pins, with Screwdriver and Nuts. ✔ Valued Pack : Contrasted with the original band, you can save much to purchase our vivosmart HR+ band without any coupon. You will get the 30-day-money-back guarantee and 12-month-quality guarantee so as to provide you a wonderful shopping experience. So if you have any problem, please contact us without hesitation. If you have any questions about this product by JIARUILA, contact us by completing and submitting the form below. If you are looking for a specif part number, please include it with your message.